Cambodia was the last stop during my South East Asia month, right after Laos and Vietnam. 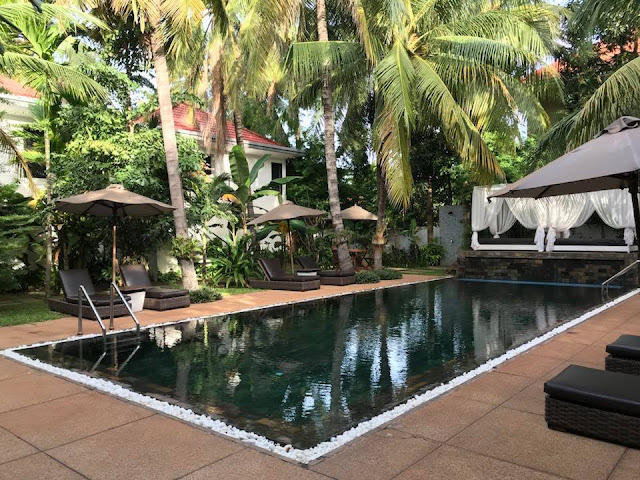 What first led me to Cambodia was a yoga retreat I had chosen to attend in Siem Reap which was situated among temples and nature, however my plans changed once I found out my friends were going to be in Cambodia at the same time as me. 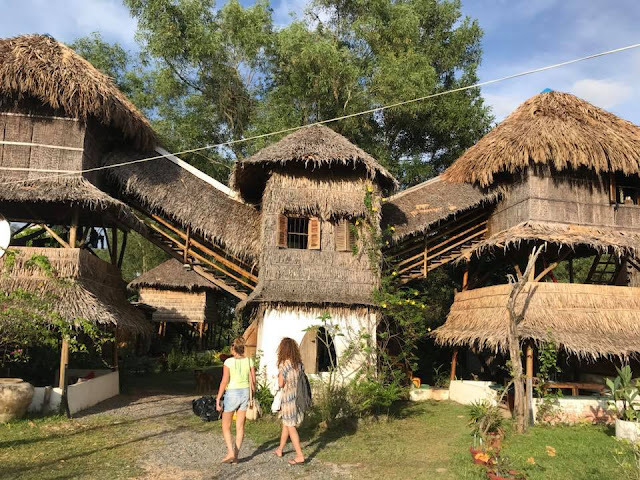 Our itinerary mainly included spending time in two cities: Siem Reap and Sihanoukville; the latter took us to a nearby island called Koh Rong Samloem for one night, which is a smaller island than the famous Koh Rong and supposedly more exotic. Before I delve into sharing travel tips, I want to write a little bit more about my overall trip in Cambodia. All in all, it was quite nice and memorable, yet it wasn't my favorite among the different countries I've visited in South East Asia so far. Of course, I only saw a small part of it and I am probably not fit to judge, but if I had to choose between Laos / Bali or Cambodia for nature, I'd pick any of the first two; as for a combination of history, culture and nature: I prefer Bali. The major exception of what makes Cambodia special will always be Angkor Wat. This is an experience on a different level, whilst everything else speaks of poverty, unfortunately. 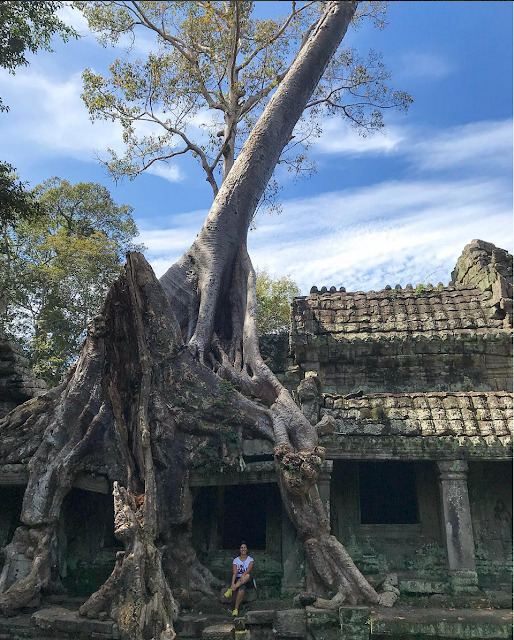 Ta Prohm Temple aka Tomb Raider Temple - where nature claims what it owns! What made me feel like a hypocrite was being a tourist in a poor neighborhood, and that feeling was emphasized when we went to the floating village. It's definitely a very interesting experience where you learn quite a bit about how people live in some parts of Siem Reap. Nevertheless the hypocrisy remains mainly in knowing that "outsiders" have turned the Floating Village into an out of city exotic day tour, whereas only a very small portion of the money, made from these tours, actually goes to the actual people living in the floating village - that's what I was told and I sort of believe it because if they were receiving the full amount, they wouldn't probably exist in the way they still do. I didn't know much about it before going, but then when you witness it you're both impressed and sad at the same time. 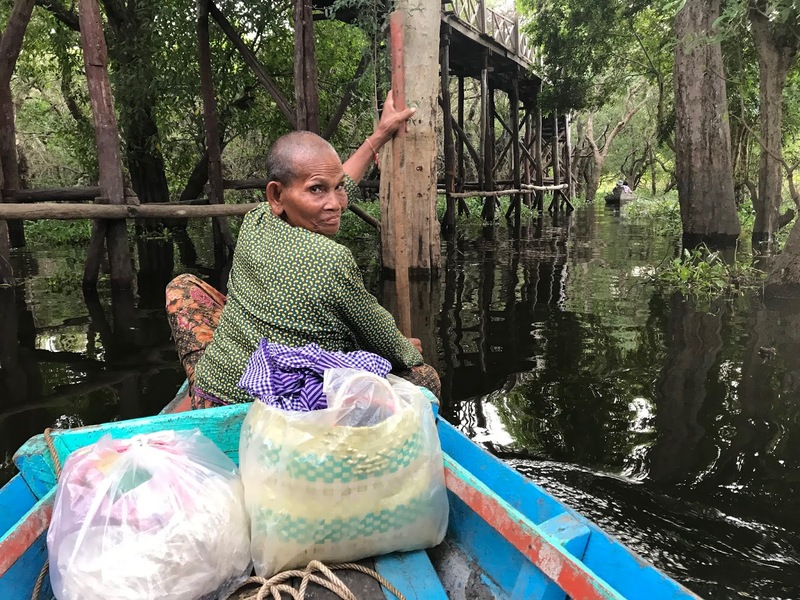 I have to admit though, in addition to the main boat tour that takes you through the Floating Village, we did a stop at what seems to be the village's center, and from there we took smaller boats, mostly operated by women, that took us through beautiful mangroves. It was magical. My Instagram post about the floating village, full caption here. 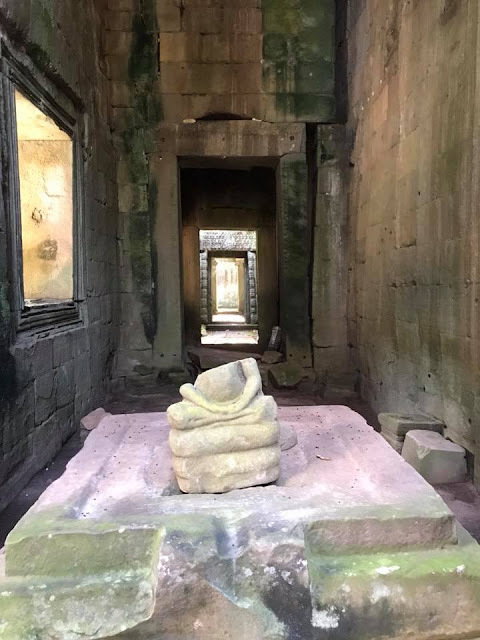 One of my favorite parts of Siem Reap is of course Angkor Wat; the fact that you're witnessing the genius of the architecture and construction of these ancient temples, will leave you in a state of awe. The other favorite part was the fact that I was staying outside of the city center of Siem Reap. That part was incredibly loud, noisy and crowded, specially during the night with its night market. It might feel vibrant and fun at first, but a couple of minutes later that feeling vanishes. You can't walk in Cambodia without being "invited" to either buy something or hire a tuktuk. I can certainly say I heard "Tuktuk lady?" at least 4-5 times per minute. Anyway, my resort was actually 15 minutes away by tuktuk situated a bit outside of the city center and more into the forest. And the best thing about this resort, is that it's the modest, chill kind of resort. It's super cute and a completely affordable resort. I truly recommend it as it was one of my favorite things in Siem Reap. I spend the last day mainly sitting by the pool and reading and listening to music, had the whole pool for myself. I believe most people don't need a visa to enter Cambodia. For Lebanese passport holders, you can get a visa on arrival. It is recommended you start the process online (costs more but you save time waiting on arrival) on the Cambodian Immigration Website. Before traveling to Cambodia and while you're in the departing airport at check-in counter, there's a slight chance you might be asked to provide few documents, including the online visa you already did. This didn't happen to my friend who's also a Lebanese passport holder, yet it happened to me. The ground staff were WhatsApping the Cambodian immigration to see if they can allow me to travel to Cambodia. I had to wait for 45 minutes before I was cleared to get my boarding pass. Chances are it won't happen to you, but it helps to be prepared, you can view here the list of documents you need to have on hand: details in this post. I arranged transportation with my hotel who provided a free pick-up and free drop-off in a tuktuk. Within the city, you will move around in a tuktuk as well. In general, it costs 2-3$ per ride. For your Angkor Wat tip, you can hire a tuktuk with the driver for a day for 15$ or so, and if there is 2-3 of you, that's quite cheap. As for money, there is no need to convert, everyone deals in USD at a fixed rate (1$ = 4000 Cambodian). 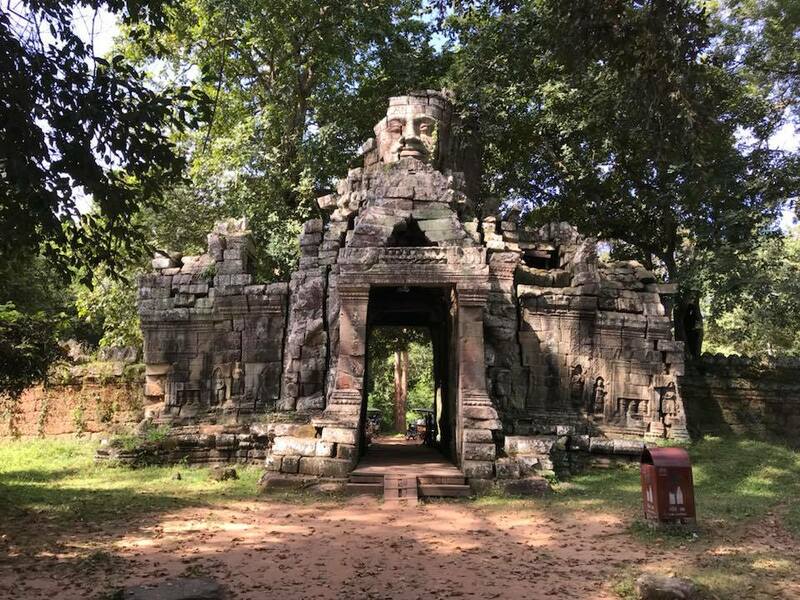 As for transport between Siem Reap and Sihanoukville, and same for Phnom Penh, you can either take a long bus (which always stops in Phnom Penh, before heading to Sihanoukville, or by plane. Honestly speaking, I definitely recommend the plane over a long trip by bus. Angkor Wat: You can get either a 1 day ticket or 3 days ticket which you can use over 10 days. I personally felt one day was enough, even though I bought the three days one. Make sure to hire a guide while there (at least for the main Angkor Wat temples), a tuktuk driver for the day, make sure you do the sunrise tour (the famous Angkor Wat sunrise), you can also do a sunset tour, do the small / big circuit, and remember souvenirs are more expensive there so maybe leave it to the night market. 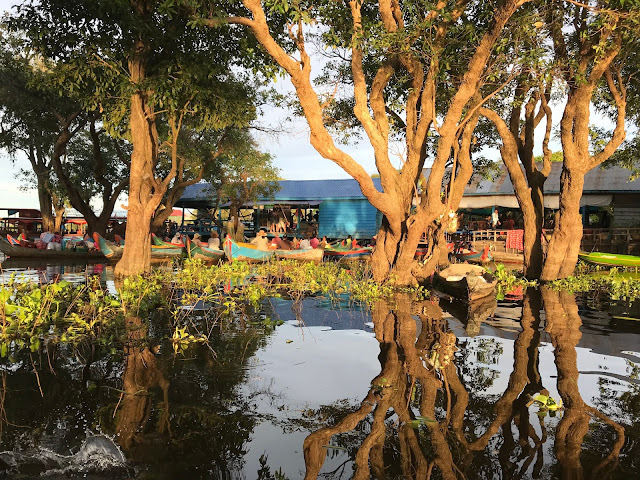 Floating Village: Boat will take you to a Floating village, we went to Kompong Fluk, which is not the closest nor the farthest, from there they switch you to a smaller boat that takes you through the mangroves and then they take you to watch the sunset. I stayed in Suorkear Resort (out of the city). They provided me with free airport pick up and drop off (in a tuktuk, it started raining and the poor guy had to close the tuktuk with the curtains while it rained on him), and drop off in the city center during certain times of the day which is great. It was a small but very cozy, quiet and nice resort, with a beautiful relaxing pool and a common area for food and entertainment (billiard). It was also quite affordable, only 40$ a night for a double room. My friends stayed in Onederz hoste, it was by the night market, quite central, very nice hostel and obviously super cheap (8-9$ per night). They also organize tours, which could make it easier for you to plan your days there. 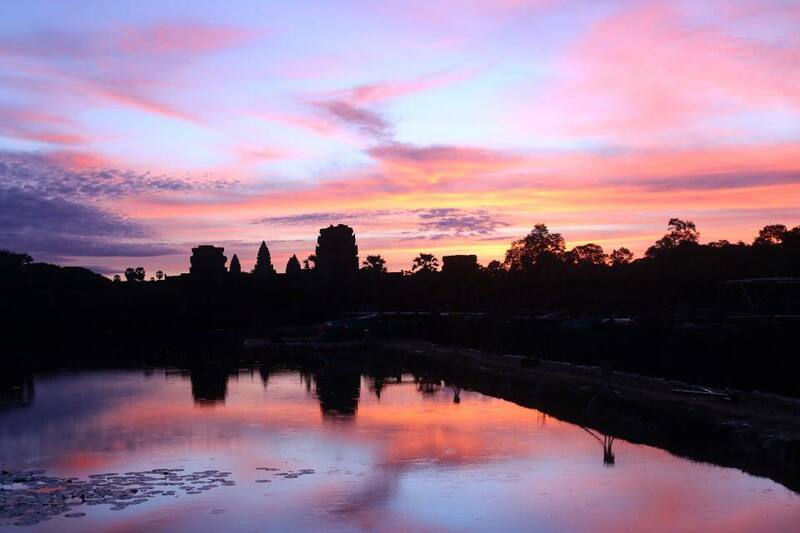 Recommended duration in Siem Reap would be around 3-4 days. 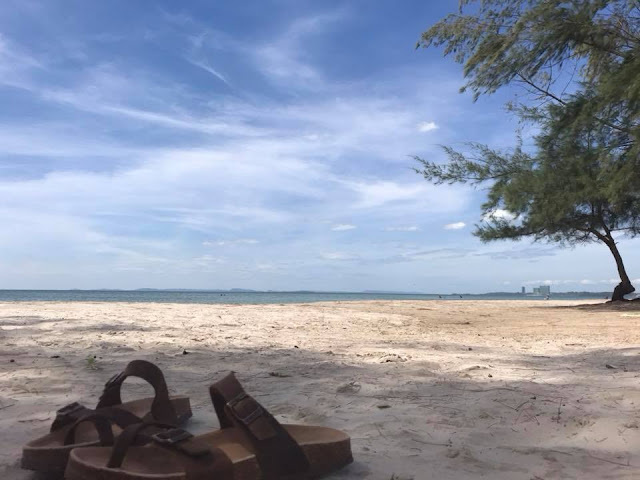 Accommodation: Sihanoukville is a beach destination, it’s nice and quite cheap. Most tourists there are of a young age. It's quite chill, not very populated, with a lot of small and cozy hostels, distant from each other (specially if you were closer to Otres Beach, which is the less crowded by beautiful beach). 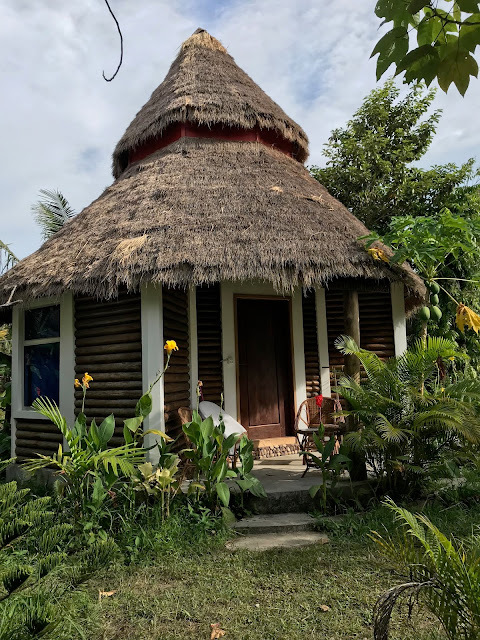 We stayed close to Otres beach in Mama Clares huts (shared bathrooms). It was a bit isolated from the city center. If that's what you seek, then that area should be suitable for you. You can also stay in Onederz hostel the night you come back from the Island, it was only 9$ per night, very clean and super comfortable (it was a really pleasant surprise). What you can do near Otres Beach is mainly swim and chill. And of course try out the different restaurants around. 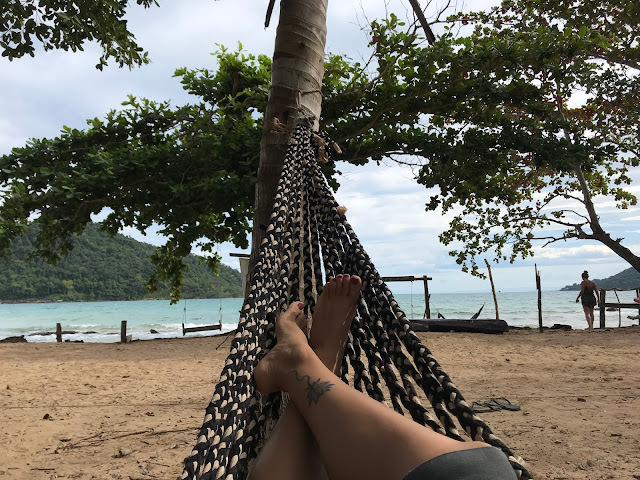 Recommended Duration: If you plan to go to Koh Rong and / or Koh Rong Samloem, dedicate at least 3 nights to make it worth it, boat trips can be bumpy. I also recommend you come back one day before your flight out of Sihanoukville as there is a risk a boat ride can be canceled if weather conditions don't allow it. Travel light: If you’re heading to the island, a backpack is much more practical, because it's literally just an Island that is all sandy, there are no pavements so it's extremely difficult to drag a heavy carry on or suitcase (trust me, it was hell! luckily our hostel was close by). Chill, swim, snorkel, island tour, visit different bays. Go to the shore at night when they shut down the light so you can spot the planktons. We tried seeing them unfortunately we couldn't. They're not on all beaches, so ask for the best one, a popular one is Koh Rong Long Beach. Accommodation: I recommend you stay in M Pay Bay bungalows (it was an amazing price - 25$ per room, private bungalow and had its bathroom, close to pier). 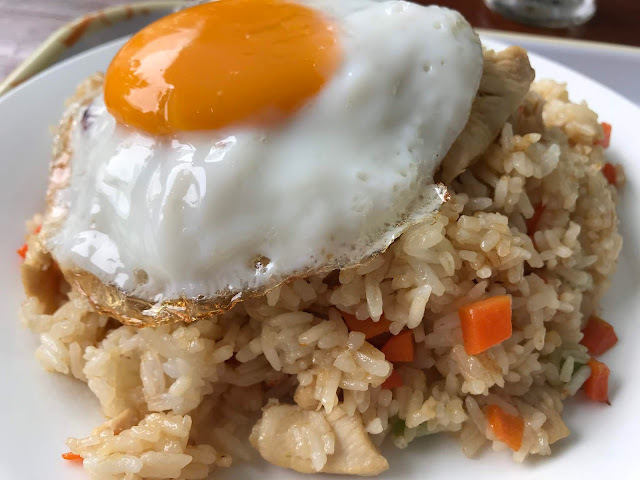 Khmer cuisine, fried rice / noodles. Other than that, there was nothing immensely special. Budget per meal is around 3$ in cheap places and 8$ in slightly more expensive ones. 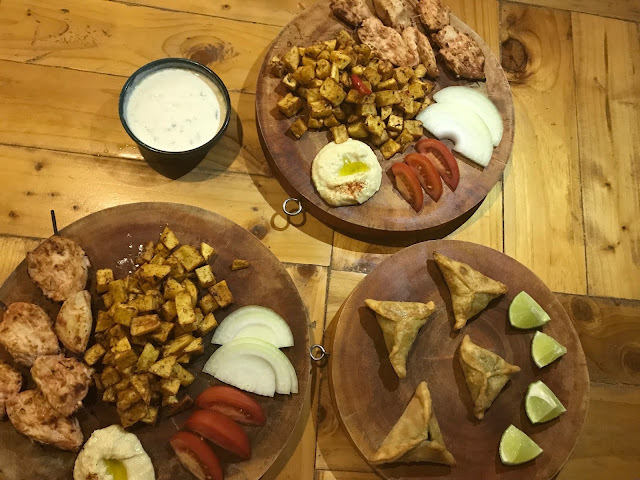 We found a Lebanese restaurant in Otres Beach believe it or not!